In the United States, 14.5 million children under the age of 18 live below the poverty line and an additional 13.1 million live in food-insecure households. Lack of access to healthy food leads to higher obesity rates, lower academic performance and decreased quality of life. “As part of race weekend for the six select events, the IRONMAN Foundation will deliver the backpacks to a local nonprofit organization that serves at-risk youth, powerfully linking our athletes to the local community and leaving the IRONMAN legacy behind, long after race day,” said Sarah Hartmann, Community Relations Manager for The IRONMAN Foundation. To further this initiative, the IRONMAN Foundation has applied for “A Community Thrives” grant from the USA Today Network. If selected, the six nonprofit partner organizations will each receive a $10,000 grant to enhance or start new programming that keeps kids healthy and active. Voting opens on April 12 at 11:59am EST and closes on May 12 at 11:59am EST. To vote, visit http://bit.ly/VoteIMF. The six IRONMAN events are the Memorial Herman IRONMAN North American Championship – Texas, the 2017 IRONMAN 70.3 World Championship in Chattanooga, Tenn., IRONMAN 70.3 Lake Placid, the IRONMAN World Championship in Kailua-Kona, Hawai’i, IRONMAN Florida and IRONMAN Arizona. As part of race week, athletes and their supporters are invited to visit the IRONMAN Foundation in IRONMAN Village and support the initiative. 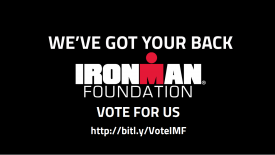 For more information on the IRONMAN Foundation We’ve Got Your Back(pack) initiative, visit www.ironmanfoundation.org/programs/weve-got-backpack/. For more information on IRONMAN and The IRONMAN Foundation, please visit www.ironman.com and www.ironmanfoundation.org. For media related inquiries, please contact press@ironman.com.